In this project, we propose a system for historical place guidance using iBeacon. The system announces the next direction to go to the destination at the right place and timing. We think that this type of particular place guidance can be realized when the beacon module plays two types of role: quiet and notified beacon modules. We introduce an historical guidance system by placing these modules along passage ways in a building appropriately to change the contents of advertised information displayed on the smartphone depending on the history of automatic triggering of the modules. This method for changing the contents of advertised information enables to navigating pedestrians to their destinations. iBeacon is a new technology developed by Apple that has been built into its operating system and devices since 2013. It is based on BLE (Bluetooth Low Energy). iBeacon functions as an indoor positioning system, that allows businesses to advertise their presence to nearby smartphones. With iBeacons set up, businesses can send messages to potential customers (such as special offers or goods) when they walk past an iBeacon. For the recent explosive spread of smartphone users in the world, the possibility of novel services using smartphonehas been explored. One of exploring fields is the close-rangewireless communication technology, such as Bluetooth and Wi-Fi. 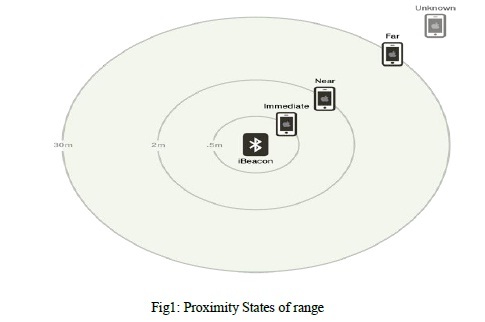 As a recent trending topic of this, there is iBeaconproposed by Apple Inc. iBeacon is a concept of wireless communication service using Bluetooth Low Energy (BLE). It enables to communicate between a beacon module and a smartphone at proximity with saving electric power. The beacon module emits radio waves basedon BLE to broadcast an automatic triggering to smartphone users at proximity to push information with help from an installed application. A typical use case of iBeacon is automatic information transferring for in-store advertising and couponing. It also enables to use as guide at historical places where the beacon module is placed and Received Signal Strength Indicator (RSSI) measured by smartphone. Because iBeacon is basedon the BLE technology, it is available in the latest versions of iOS and Android OS. A service by iBeacon is usually done by a single beacon module that corresponds to single automatic triggering forpush-type information advertising regardless of any contextof smartphone users approaching to the module. The main objective of our proposal is we making use of a wireless hardware named iBeacon that works using Bluetooth Low Energy (BLE) signals broadcasting a unique ID. In today’s world people visiting India has been increased but meanwhile the middlemen’s misguiding & misleading those visitors has also increased. Most of those middlemen’s in the name of guiding the visitors are manipulating the history of the place as per their needs just to grab money from visitors and also many of the visitors also face language problem. Hence our idea is to provide the user with a mobile app (iOS or Android are possible) where and which the user gets Notification and Information about some respective places when the tourist visits to the iBeacon Range of the registered iBeacons. The device provides information in the form of fields via Bluetooth Low Energy . UUID, major, minor are the three values provide the identifying information for the device. UUID is specific to the iBeacon device for differentiating different iBeacons, major further specifies a specific device and use case, minor allows further subdivision of region,specified by application developer. 1. Immediate : This represents that device is physically very close to the beacon device. 2. Near : This indicates proximity of approximately 1-3 meters. 3. Far : This state indicates the beacon can be detected but the accuracy is too low. 4. Unknown : The proximity of the beacon is not determined. Once after installing the Beacon wireless hardware at a particular location, the signals are received from mobile devices through the App. The signal strength is generally correlated to how far away a device is from beacon. This beacon device are mobiles and can be placed around tourist and other historical places, it is easier to personally inform brief information of the particular place to visitors. The beacon device utilizes Bluetooth Low Energy Technology which consumes much less battery.  When using iBeacon in combination with cloud based processing, 3G4G connectivity is required and can turn out to become very expensive for the end user. 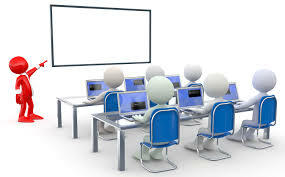 This application can be used in places other than historical places,like hotels,malls,departments,colleges,libraries etc.., and authentication can be provided. 1. This application makes it easier to personally deliver brief information of the particular place to visitors. 2. By implementing this concept we can overcome the middlemen’s act in distorting the tourists. 3. These beacon devices are portable and can be placed around tourist and other historical places. 4. The beacon device utilizes Bluetooth Low Energy Technology which consumes much less battery. By these above points it can be concluded that this application usage can overcome many existing system disadvantages and provide one of the best application for the visitors to know heritage of our Historical places.